I think I’ve been to Mexico 6 separate times. I love going to Mexico. It’s easy to get to, it’s more affordable when it comes to livin’ dat beach life, and it’s always beautiful. And when my best friend was trying to decide where to go to celebrate her 30th birthday, Tulum was an easy decision. I feel like Tulum is the hot spot nowadays. I constantly see bloggers traveling there and it has become a pretty popular place to visit in Mexico. And I was so excited to see this place that so many have recommended and boasted about. But sadly, this was not my best Mexico experience. It was kind of the worst. But before we talk about the bad or the ugly, let’s start with the good. Because there is a lot of good to be had in Tulum. 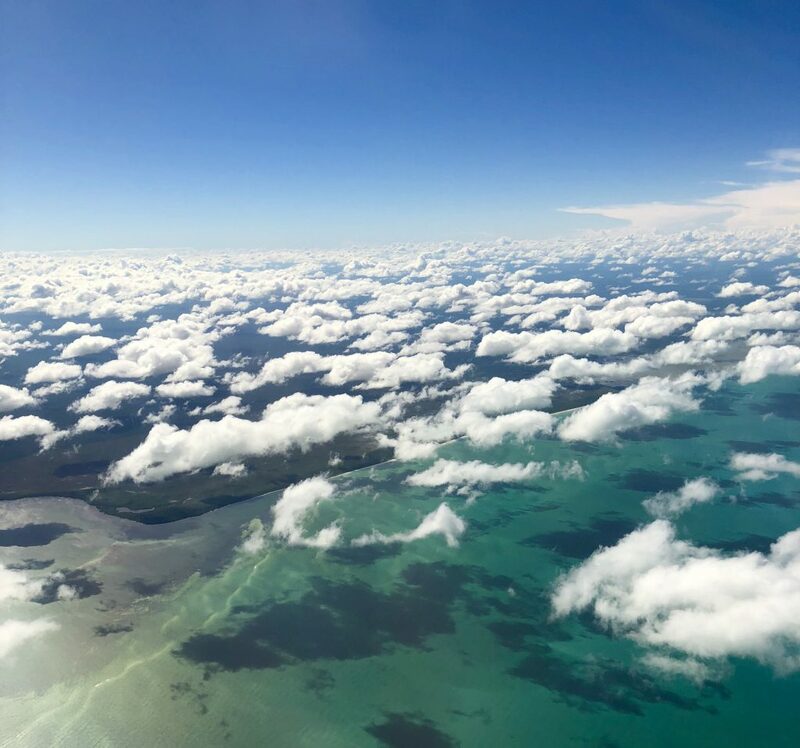 I mean, look at the view above of just flying into Cancun. Pretty stunning. 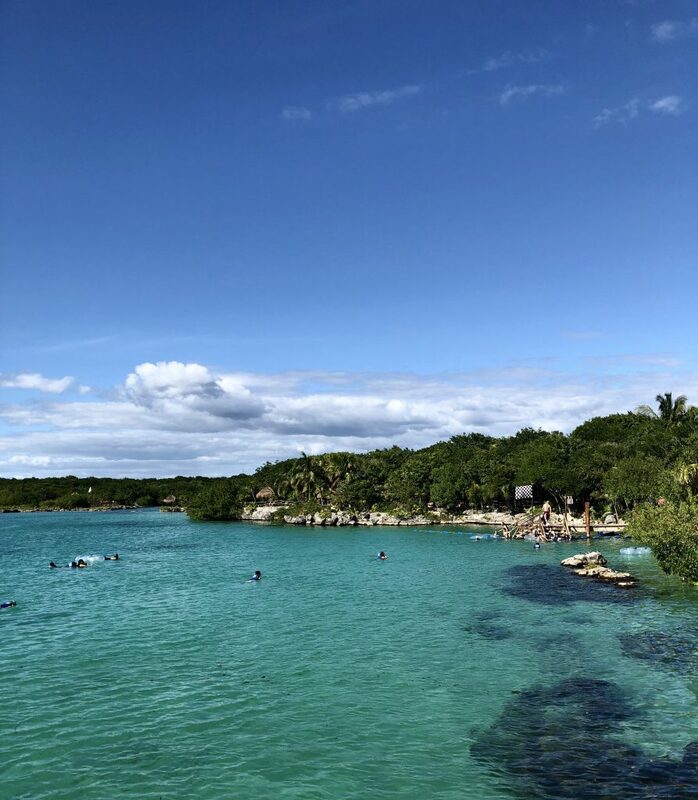 And that’s what you get when you’re in Cancun or Riviera Maya or Tulum – you get beautiful, clear, bluish-green water with clean, lovely beaches. Tulum is about an hour drive from the Cancun airpot, so it’s not too tough to get to. And when you’re in Tulum, there are bikes and scooters to rent to get you around the city a little faster. Every time I’ve gone to Mexico in the past, I’ve stayed in an all-inclusive hotel, but since there were 6 of us on this trip, my best friend wanted to have more time together and to be able to cook. So we found this little airbnb that was incredibly affordable and spacious and slept all of us quite comfortably. We all had our own bathrooms and had a good size kitchen, dining room and rooftop patio. 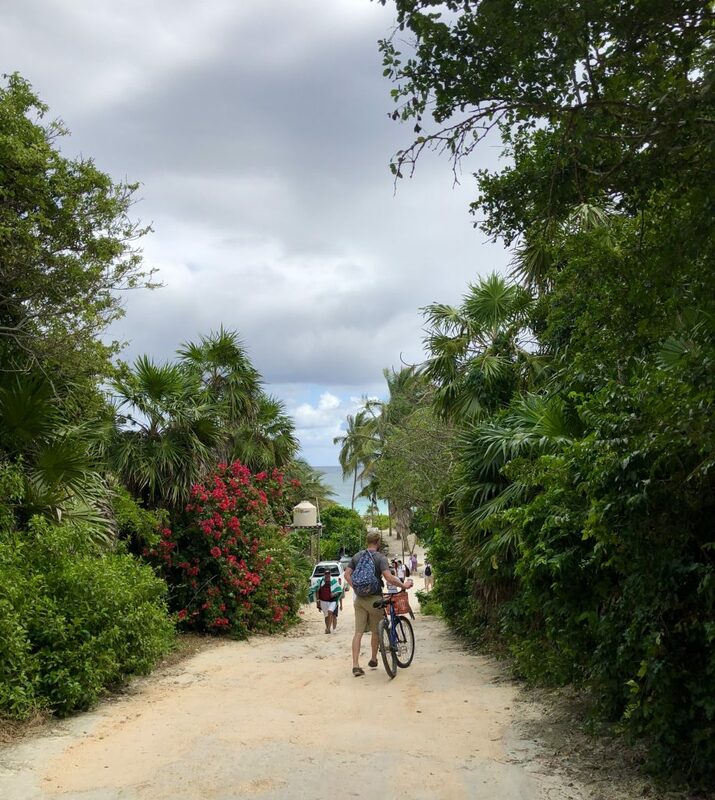 Our apartment was located right in the Pueblo of Tulum in a neighborhood called La Veleta, which definitely had some pros and cons. It was in walking distance to a ton of delicious restaurants, shops, stores, etc. It was super easy to get a taxi. It was loud AF at all hours, people were shooting off fireworks at all hours of the day (not sure why), a gas truck drives around blaring music all day errrrday, and there were constant police sirens. Since it’s in an up-and-coming neighborhood, there were dogs wandering everywhere and sh*tting everywhere, so you really had to keep your eyes down every time you were walking anywhere. It’s about a 20 minute drive from the beach, so if you want a beach vacation, it’s a little bit of a trek. We also had the issue that our apartment constantly smelled like sewage. Which isn’t super fun when you’re trying to cook dinner. But luckily we didn’t spend too much time indoors and ventured out most days. And while venturing out in the Pueblo the first night for dinner, we ended up running into a CrossFit-style gym! 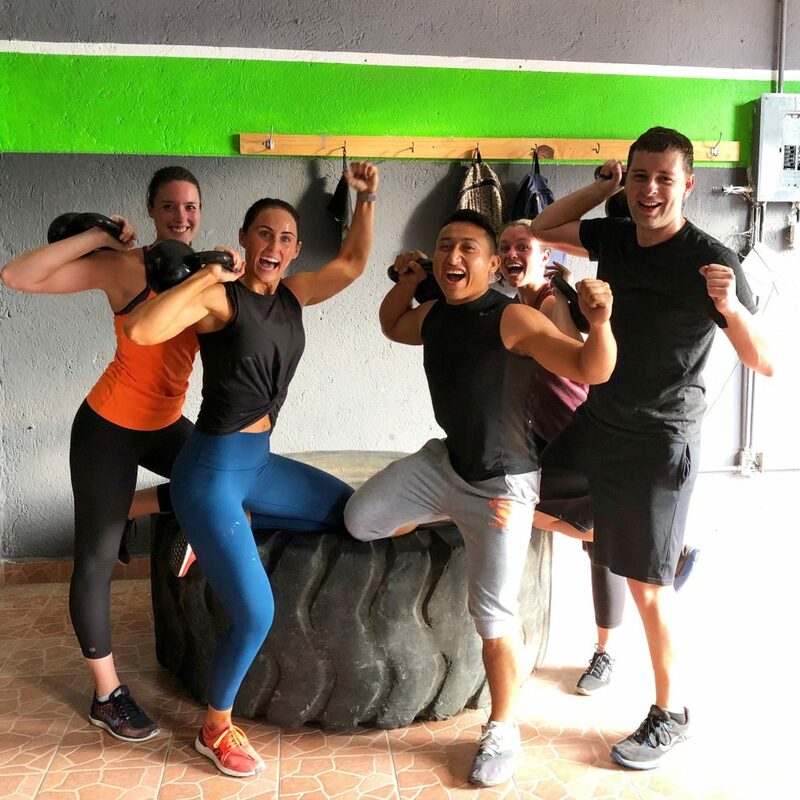 We were planning to create our own workouts to do on the rooftop of our apartment, but after finding this gym, we decided to venture in and experience a Tulum workout. And let me tell you – they don’t f*ck around. The coach made me do my own workout that included about 500 reps so I cut that number down myself and didn’t explain why since he didn’t speak English and I don’t speak Spanish. But we ended getting an amazing workout in which felt awesome before heading out for multiple cocktails on the beach. On our first full day, we rented bikes and biked down in the rain to the Ruins. You can get tickets and wander the ruins, but you can also simply follow the path down past the Ruins and you’ll run right into the beach, which is what we did. When you wander the beach, you’ll different hotels and most of them have a beach club that you can pay a fee to stay at or simply grab a bite to eat and a fun cocktail. We wandered to a random hotel that had adorable little bungalows and sat down for lunch. When we were in Tulum, we didn’t get the best weather. It was normally 70 degrees, unless the sun came out. But luckily, after biking through the rain, we were greeted by blue skies for our lunch break. I wish I remembered what beach club we were at because that’s where my downfall of the trip began. But I’ll get to that later. For dinner that night, we decided to grab a cab and head to the beach to experience one of the restaurants that was recommended by a reader. 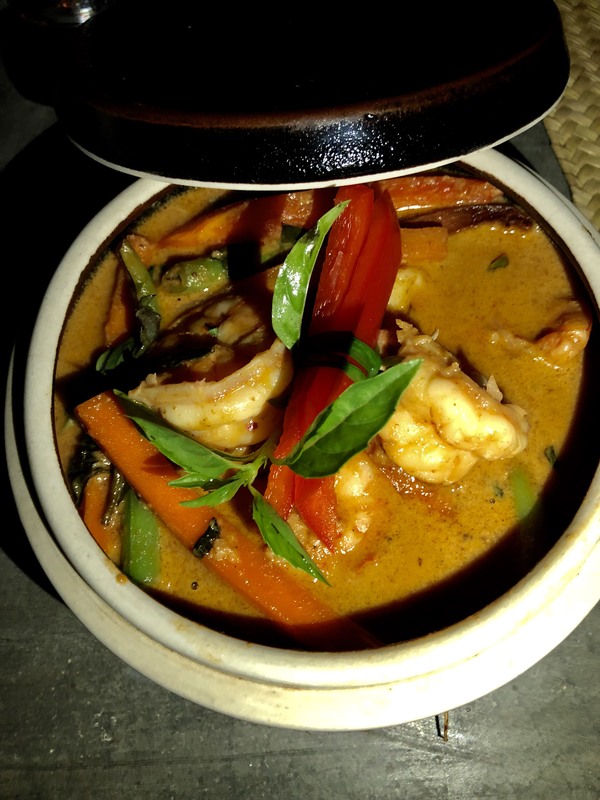 Since we had eaten A TON of Mexican food, we picked a Thai restaurant at the Mezzanine Hotel and HOT DAMN was it amazing. At one point, we all started coughing when they were cooking some hot peppers which I’m guessing was for their curry paste. This restaurant was legit and my panang curry was fantastic. I pretty much licked my bowl and wanted to place a second order. Since I wasn’t feeling too hot, I passed on the cocktails but everyone else had delicious cocktails while we were there. We were inside but this hotel is right on the beach and we could tell that the view must be stunning during the day. It made me wish that we were staying at that hotel because it was really beautiful! The next morning, I woke up feeling just a tad off, but nothing too bad. So I ignored it, pounded some bottled water and we went on our way to Xel-Ha. My best friend found this stunning water park and saw that it had almost 5 stars on Trip Advisor with around 15,000 reviews so we decided to try it out. This place has SO much to do. 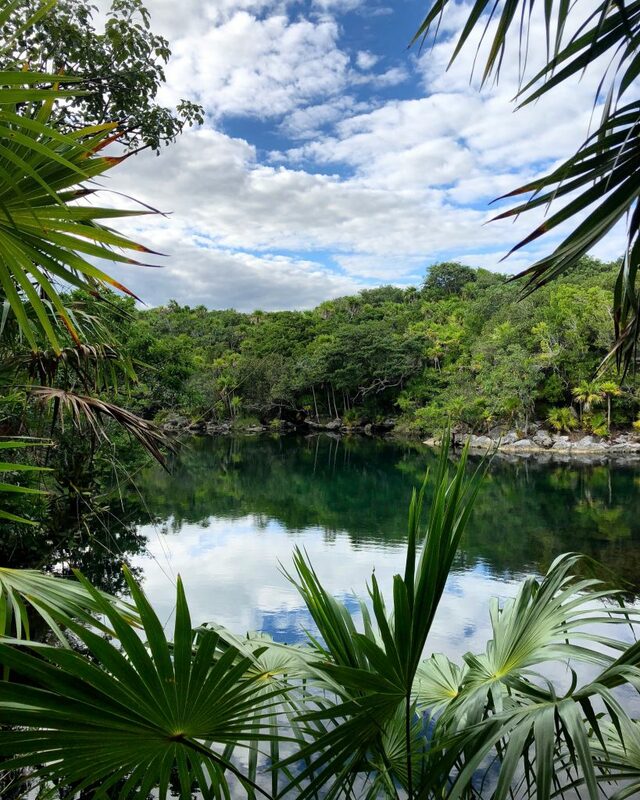 You can snorkel, sit in a tube in a lazy river (me, duh), swim with dolphins, pet some stingrays, go to the spa, go on rides, wander caves, cliff jump, zip line, and about a million other things. It’s huge. And food and drink is included. Not saying it’s good whatsoever, but it’s included so you don’t have to worry about figuring out your meals while you’re in and out of the water all day. We spent our afternoon exploring the entire place, but since I was feeling on the sketchy side, I didn’t partake in many of the fun activities. I did, however, bruise my foot trying to exit the water. Like a pro. This waterpark is awesome if you have a big group or a family and want everyone to be entertained throughout the day. I’m a person who can sit on the beach and do nothing all day long and be completely content, but I know most people like to move their bodies and experience different things while traveling. And this place gives you a ton of different experiences. I wish I could have enjoyed it more but the stomach pain and bloat started to really set in at this point. That night we stayed in and I ended up going to bed early because I was feeling pretty off. And that morning, the food poisoning really set in. Looking back (and after hearing from multiple people on social media) I think I got the food poisoning from the shrimp ceviche I had on the beach near the Ruins. A ton of people reached out and said they got food poisoning from the shrimp, especially the shrimp ceviche since it may not cook through all the way. One of the guys on our trip also had some food poisoning and he was the only other person on the trip that had shrimp like I did. So I spent that day rolling in bed in truly agonizing pain. I’ve had some pretty miserable food poisoning before and I also have a gluten allergy that can make standing impossible, but this food poisoning made sure to make it’s point. It felt like someone was sticking a serrated knife into my belly button and wiggling it back and forth. I sat in my room alone (because I absolutely DID NOT want to be around anyone) literally screaming and yelling more obscenities than usual to simply get through the pain. It’s what I imagine labor pains to feel like after multiple friends have told me, “Don’t be the hero – just take the drugs and get the epidural.” It was brutal. That day was a pretty big bummer because I not only had to miss going to that gym for a second time, but I also had to miss out on a long day on the beach side of Tulum where my friends went to hit up a beach club. Our apartment didn’t have much for blankets and I was going through some major cold sweats and had to bundle up in a fleece that I wore to the airport in Colorado then cover my bed sheet with towels. It was a real treat. Once my body stopped trying to rip itself apart, I made my way to the beach to meet up with my friends. I knew that I would either be lying in bed feeling awful or lying on the beach feeling awful, so I picked the beach. I only made it a couple hours before feeling like it was tie to turn in for the night. After getting back to our apartment and eating very little, I went to bed by 6pm and didn’t wake up until 6am. That part was magical. The next morning we packed up and headed to the airport. We ended up getting to the airport about 4 hours before our flight and because of that, there was another flight to Denver leaving by the time we got in the terminal. Since I couldn’t imagine stomaching another meal in Mexico or sitting in pain for 4 hours in the airport, I asked what it would cost to get on the flight back. They said $275 and I handed over my credit card. I would have paid anything to get home earlier, especially because I had to leave the next morning for an 8 hour car ride to Nebraska. Well, I think Mexico was giving me a little pat on the back because after trying to run my credit card for about 20 minutes and not succeeding, he simply let me on the flight. The system was down, but he was still nice enough to send me on my way! So rad. I was able to get into Denver 3 hours earlier and buy myself a gluten free pizza (which was the only thing that sounded edible at the moment) and cuddle with my pup. Thank you for that, Cancun Airport. So even though this wasn’t my best trip to Mexico, I definitely learned quite a few things. When traveling to the beach, I want to be ON the beach. It’s fun staying in an apartment and getting the feel of a city and having a space to hang with friends, but I would much rather wake up to the peaceful sound of the beach and walk straight out to the sand. I will never ever EVER eat the shrimp again while in Mexico. I was incredibly careful about the water, even brushing my teeth with bottled water, but the shrimp is what did me in. I thought being on the beach meant it was safe to eat the seafood. That’s what you would think, right? Wrong. After talking to many people on IG, it’s safe to say that shrimp is a no-go. And if you do eat it, make sure it’s extra cooked. Ceviche was a bad choice. I will always fly Southwest. I love them so much. Next time, I will definitely eat less beach club food and more recommended-restaurant food. I totally wish we would have hit up more restaurants that were recommended by readers! Hope that helps you have a great experience while you’re in Tulum and not get food poisoning! I heard about this trip in your podcast!! Yikes! Sorry you got so sick, but you sure look great in those cute bikinis! Tulum does sound like a cool place to visit. I agree, i like being on the beach, but cool that you had the city experience! i always feel so guilty writing negative reviews just because i have experienced no many negative comments and reviews with my time online. so it’s always tough for me complain when someone else might see that place differently. it has amazing reviews so maybe it was just a fluke? who knows. I gotta agree with Jill on that one! You’re being super sweet, but staying somewhere that smells like sewage would be awful! a negative review may not be pretty but in your case, definitely honest, and it certainly would make me think twice about staying there. and i am a huge airbnb fan. don’t sugar coat the review! Another favorite in the area was Turtle Bay Bakery and Cafe. Akumal was a nice in between point from Tulum and Cancun. A very small, quaint area. We never had issues with noise in our house with surrounding houses. tulum is amazing just stay right on the main drag (we stayed at ahau tulum). our balcony opened up to the beach, we slept with the doors open and the sound of the ocean, and so much was within walking / biking distance. I go to Tulum annually at least for the last 20 years. It is my home away from home. STAY ON THE BEACH. Visit the town. I have never been sick except for being over served with tequila. Lol We now stay at Hemingway Cabanas. Rustic and lovely. Don’t miss Zamas and Don Cafetos. Give it another shot Juli. Trust me. What a bummer! Sorry to hear this. I ate shrimp in Mexico last year without even thinking about it! Next time I’ll have to be much more careful. 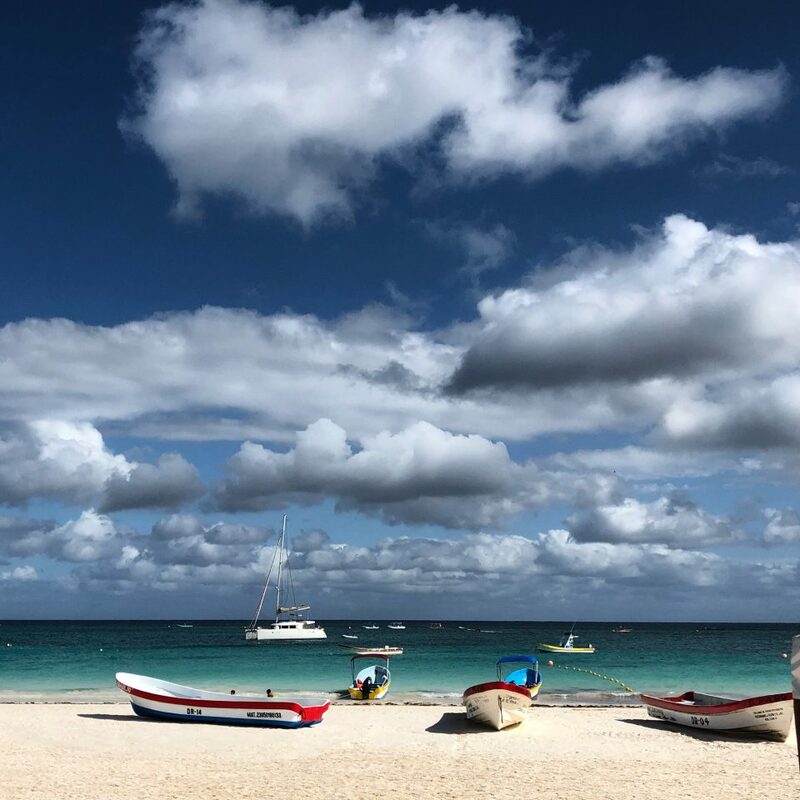 Even though the trip didn’t go as you planned, some of these pictures really make me crave another tropical vacation. We were in Tulum in November and loved it! We stayed right in the beach at El Pez and it was amazing. As for the shrimp… we ate a platter of ceviche at Chamico’s that could have fed a family if 4 and neither of us got sick, but sounds like we may have gotten luck. Best meal we ate was at Kitchen Table with Hartwood being a close second. I hope you’ll give Tulum another try because it really is amazing. Yeah, we just got back from a 3 month stint in Mexico, also in an, um, “up-and-coming” neighborhood, and yeah, the fireworks, gas truck, barking dogs, and for us spiders and cucarachas, all there. Welcome to real Mexico! Still, yet, we enjoyed all the other things so much, we’re heading back, this time to Merida, for four months. Adventure! I hear you about the noise in Tulum, we had the same experience – and yes we’d stay on the beach next time – but we’d also head to Merida for the food, which I found so much better than Tulum – there’s an excellent fish market there, where you can sit with the locals and ingest as much shrimp ceviche as you can handle for a few pennies! soooo much noise. thanks for the recommendation! GF, I feel like we had a similar Tulum trip. I saw that we were in Tulum at the same time you were and though “oh how awful she has food poisoning, this place is beautiful!” And then the ugly monster hit. Likely the shrimp on our end too. We went to an AMAZING restaurant called el camello. It had great reviews and looked nice, but our American stomachs apparently couldn’t handle the giant platter of seafood we ate. Luckily we didn’t get 100% sick until we were back home! We just thought Tulum was a hotbed for crazy criminals and people were dying at night when we first heard the sirens and car alarms. Cool tradition I guess, but FACKING ANNOYING noises. I would also recommend La Querida/La Malquerida (same restaurant, two names) for food. This place was AMAZING and we never felt sick from it. Also had a great gelato shop next door! booooooo!! so sorry you had to go through it too!! damn the seafood lol!! thanks for the future recommendations! So sorry you had such a terrible experience =( Food poisoning is the literal worst. I got it back in September and it took a MONTH for my gut to feel better! (I took myself to a GI doc to rule out anything more serious.) I can’t imagine going through that anywhere but the sanctity of my own home. Advice needed- what all inclusive resorts have you stayed at in Mexico? We’re trying to plan a spring break trip (from Denver) and Mexico is just wayyyyy shorter of a flight that anywhere in the Caribbean. Thanks in advance! we’ve stayed in el dorado in riviera maya a couple times and love it. i’ve also stayed in a secrets resort in jamaica and heard that mexico secrets resorts are amazing!! I’m sad you didn’t have the best experience! I got engaged in Tulum and I LOVE it – so beautiful. Will always have a special place in my heart! Any time I see someone there I get envious. Maybe one day you can give it a second go-around and hopefully it will go better! Aw such a bummer to be sick! That happened to me in Bali – NO FUN! I travel to Tulum a lot and love it so much. I hope if you go again you’ll have a better experience!! I’ve yet to hit up Xel-Ha though, thanks for the review on that. Thank you for the review. I am heading to Tulum in a couple of weeks with a couple of friends. I will stay away from the shrimp! I have celiac disease. Is it easy to eat gluten free there? I am always terrified of eating gluten on a beach vacation and needing to cover up my wheat baby the whole time I am on the beach. The fireworks, loud cars, sewage smell in the bathroom, and street dogs are all typical of being in Mexico, I hope you didn’t write them in your airbnb review because this is how most towns are there. It sounds like this is the first trip where you experienced actual Mexico. the sewage smell wasn’t the bathroom, it was the entire house lol. and i’ve been to mexico 8 times at this point and i’ve never experienced that anywhere i’ve stayed. but no, i did not leave a review since i didn’t actual rent the apartment. I travel to Mexico (Tulum was a fav of mine over 10 years ago, but I haven’t been back because Roatan is so much better), Honduras, and other “3rd world” countries annually and I always eat street/beach food and I always pack activated charcoal. If I feel suspicious of the food I’m about to eat or I start to feel a tad sketchy in the G.I. area, I make sure to start downing the charcaol pills or drinking a charcoal slurry. Powder is better as you can get more and make said charcoal slurry, but it’s messy. That powder is so fine and you need about a Tbsp per cup, so pills are easier when traveling. However, at 1/4tsp per pill more or less, you need to chase down 12 of them if going the pill route or open them into a bottle of water (um, tedious). So ya have to pack a lot of pills or a little container of black powder. Looks a tad suspicious, but if it saves me from food poisoning, who cares! I haven’t had an officer question me yet on it. If you haven’t heard of taking activated charcoal or just haven’t tried it yourself because it sounds weird, it’s completely tasteless and yet EVERYTHING microbial sticks to it like glue and since your body can’t digest charcoal, it goes right on through. There’s a reason they use it in ERs everywhere for overdoses, poison ingestion, etc. and why it’s in water filters. It saves lives. It’s black and gritty of course, if you mix the powder in with water, but completely tasteless. If you’re used to mixing in green powder with a beverage and it’s on the gritty side, then you’ll manage this texture no prob. So. Activated charcoal for food poisoning. If it doesn’t work, it probably was viral and not food poisoning.